What happens if the customer does not answer the agent’s callback? What is the difference between the answered and handle metrics? A callback is an outbound call requested by a contact. Agents can schedule a callback during a voice interaction. At the scheduled date and time, PureCloud routes the interaction to an agent. For more information about how to place, transfer, or dismiss a callback, see Voice interactions for agents overview. From a voice interaction, click the Schedule a callback icon. Type or select the date for the callback. Type or select a time for the callback. If the contact is not in your time zone, begin typing a time zone name and, from the list, select the appropriate one for the contact. Each time zone gets its name from a continent or ocean and then the largest city in the region, for example, America/New_York or Europe/Paris. When agents schedule a callback, or administrators populate zone columns in a contact list, use the following zone names. If the contact wants the callback to use a different phone number, type the number the contact prefers. To route the callback to you, select Route callback to me if possible. By default, scheduled callbacks route to the queue that received the original interaction. 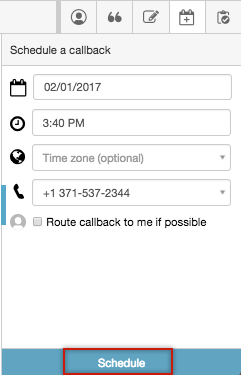 Note: If you miss a scheduled callback, PureCloud routes immediately to the next available agent in the queue. Note: You cannot schedule a callback for more than 30 days in advance. Note: A user with the PureCloud Supervisor default role can cancel a scheduled callback.